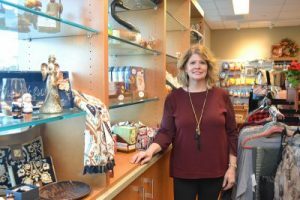 Debbie Baril, Connucopia Gift Shop manager. The Connucopia Gift Shop opened in 1975. It is located at the UConn John Dempsey Hospital on the Main level near the chapel. The gift shop is staffed by volunteers. Here for the needs of the UConn Health family and its patients, the gift shop offers stationery, jewelry, stuffed animals, baby clothing, officially licensed UConn merchandise, fresh flowers, snacks, and more. Gift certificates and gift cards are available, and purchases are exempt from the state sales tax. A gift kiosk opened on the first floor of the Outpatient Pavilion in 2015 which is also staffed by volunteers. Proceeds from gift shop sales benefit the Auxiliary’s programs and projects. Please call 860-679-2963 to ask about volunteer opportunities.